In recent years, Lynchburg has become an ever-brightening spot on the map, drawing increased interest—and guests—to its hilly borders. Near the airport, in the counties, off Wards Road and downtown, new lodging developments have been sprouting in response. “[Hotel] developers right now are viewing Lynchburg as a growth area and they are willing to invest millions of dollars to be a part of what we have going on,” said Lisa Meriwether, Sales Manager for the Lynchburg Regional Convention & Visitors Bureau. It is important to note that one hotel is not the same as another from a business perspective—hotels are not all marketing to the same type of customer. Each business carves out its own niche based on the amenities it offers. So, an influx of new hotels does not only suggest more customers are coming to the area; it indicates that more types of customers are coming as well. Currently there are 17 hotel properties in the area—collectively offering about 1,700 beds—with three developments on the horizon: a Residence Inn by River Ridge Mall, a Homewood Suites off Wards Road adjacent to the Hilton Garden Inn, and The Virginian Hotel, a historic property under construction downtown. Statewide, tourism is on the rise. A recent report from Gov. Terry McAuliffe’s office announced that 2016 saw $24 billion in tourism revenue across the Commonwealth, a 3.3 percent increase over 2015. And locally, Lynchburg is seeing continued growth in its hotel sector. Meriwether pointed out that data showed a 3.5 percent rise in occupancy in the area from 2015 to 2016. Likewise, the Average Daily Rate (ADR) per room grew from an average of about $95 to $96.85 per night in the same period. Tourism in general has a very symbiotic relationship with other businesses in the area, explained Anna Bentson, Assistant Director of the Lynchburg Office of Economic Development. That is why Lynchburg established the entire city as a tourism zone two years ago, allowing it to tap into state funding opportunities. Area hotelier Peter Greenberg, owner and operator the Kirkley Hotel on Candlers Mountain Road for the past decade, said he believes the growth trend is “net positive” in the community. “I am very satisfied with my investment and the future of my investment from the data that I have,” he said. But Greenberg tempered the optimism with caution when he commented on how The Virginian was funded, in part, by a $5 million loan agreement with City Council. In early April, the City proposed a two percent lodging tax increase. (Note: a final adoption of the budget will take place after this issue goes to print). Greenberg stood up before council to say that this will undermine all the work done to attract business. Reached by phone, he also said that it will cause hotel developers to strongly consider building outside city lines, in the counties. Pointing to how the market is, in fact, working itself out in other locations, Greenberg noted that hotel developers who are “extremely sophisticated” are looking at the area and justifying major investments. At the foundation of all of this development is an interest in the tremendous growth of the area. “There are just lots of flags going up right now [and] developers are paying attention,” Meriwether said, pointing out that the two biggest factors interesting hotel developers specifically are the downtown revitalization and the growth of Liberty University. Liberty, as well as the growing “corporate demand,” is bringing diverse customers to the market—types who frequent different Hilton brands, whether it is visiting professors looking for larger suites when they stay multiple nights (and might, therefore, be interested in the forthcoming Homewood Suites) or traveling businesspeople looking for an upscale select service with a restaurant and bar within their hotel (like at the Garden Inn). “Lynchburg is a beautiful community … it shows with the numbers we are getting at those [current] properties,” he added. At the heart of this revitalization will be The Virginian. There is a lot of buzz circulating around The Virginian, which will be a very upscale, boutique attraction. The Virginian is a Hilton Curio Collection partner, one of less than 50 worldwide. These premier hotels are one-of-a-kind masterpieces, unique to the area they are in. In addition to 115 rooms, dining areas and a rooftop lounge, The Virginian will feature 8,000 square feet of banquet and conference space, including the historic property’s grand ballroom, which is being immaculately renovated. 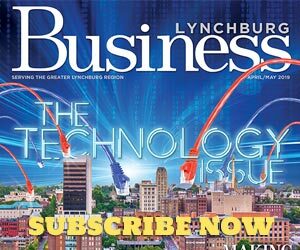 “Corporate groups are going to be interested in coming to the Lynchburg area as opposed to going to Roanoke or Charlottesville or Richmond,” Shideler said. The Virginian is stirring waters of new business, with waves set to cascade toward Lynchburg once it opens. “Everybody wants to know when The Virginian is going to open,” Meriwether said. “We are fielding leads … association executives, association planners. But the ripples will expand to other parts of the city. Read more about Lynchburg’s hotel boom in our Commercial Real Estate column on the next page.